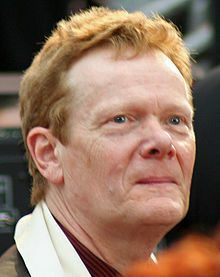 Philippe Petit (French pronunciation: ​[fi'lip pə'ti]; born 13 August 1949) is a French high-wire artist. He became famous for his high-wire walk between the World Trade Center in New York City, on the morning of August 7, 1974. The 2015 movie The Walk is based on his high-wire walk in New York. ↑ Lichtenstein, Grace (8 August 1974). "Stuntman, Eluding Guards, Walks a Tightrope Between Trade Center Towers". The New York Times. Retrieved 18 April 2008. Combining the cunning of a second-story man with the nerve of an Evel Knievel, a French high-wire artist sneaked past guards at the World Trade center, ran a cable between the tops of its twin towers and tightrope-walked across it yesterday morning. This page was last changed on 25 March 2019, at 02:17.